Deep foliage, nor canyons faze the rugged eTrex Vista HCx. Its high-sensitivity receiver holds a GPS signal in the toughest environments. Similar to the Vista Cx, this handheld navigator also has a bright color screen, barometric altimeter, electronic compass, microSD™ card slot and automatic routing for wherever adventure takes you. I frequently recommend this GPS to folks looking for a powerful, yet easy to use GPS. I have personally used this GPS on a half dozen or so bikepacking trips and it kept me on track and has never let me down. Map capacity is good — it comes with a 64 mb SD-card, and I have never felt the need to upgrade it. Even with the newest Mapsource Topo 2008 maps I can still fit enough maps to cover a weeklong trip (e.g. all of Arizona). Track capacity is good enough for hundreds of miles of trail. It takes a little GPS software know-how to optimize your track points (I use the “saved tracks” area of 20 x 500 point tracks). Minor complaints: the screen is a little small. The 60CS series is larger, but you pay for it in the bigger, bulkier, harder to mount unit. The good part is that the Vista’s screen is easy to read, even in direct sunlight. Some units have had problems with vibration shutting them off. Mine has been rock solid for thousands of miles and has only very recently starting occasionally shutting off. Sometimes an update of the firmware can help here too. I use the regular Garmin GPS mount and have never had the unit pop off or any other issues. I leave it a little loose on the bars in case of a crash, and also so I can adjust viewing angle while riding. 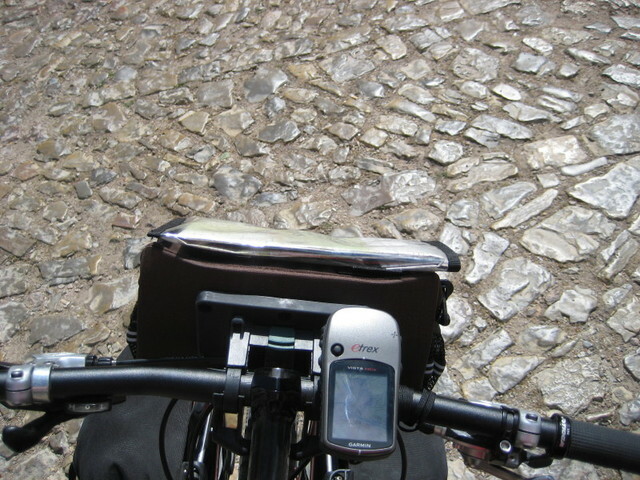 My unit popped off the Garmin GPS Handlebar Mount and was never found. I would recommend making an extra tie to make sure that if it does fall it doesn’t get lost. About the shutting off – It was hell until I fixed it by opening the unit and cleaning contacts. Ben — I’m curious what you used to clean the contacts? The vibration from riding can do a number on some older units. Apparently it is easy do develop “false contact” from the batteries to the unit. There are posts on several forums (cycling, motorcycles, 4×4 off roading) explaining how to fix it. It involves soldering wires from the power supply to the circuit board. I’ve had an VIsta HCx for over a year. I chose it over other cycling specific Garmin models because of the regular AA batteries it uses (also price). I felt that proprietary battery packs are a hassle when travelling several days away from home. Can’t always plug a charger in the woods, but a couple of AA batteries are easy enough to carry along and purchase along the way. On the negative side, I feel that Garmin software for MAC could be better. About losing the unit while riding, I use the lanyard and wrap it around the handlebars. Also, I place a piece of cardboard on the handlebar mount to take up the play. Here’s a write-up I did on the Vista HCx for on the road/path bike touring. Regarding the vibration issue. I started with a Legend HCx, and it did turn off on rough gravel pretty frequently. I haven’t had that problem with the Vista, yet. Could be a difference in the bikes they were mounted though. @Daveharris and @perdido, thanks for the leash tips, could save me a GPS in the future. @perdido, thanks for the info about the contacts as well. Hopefully I will never have this issue. I’ve seen some tricks using a sponge or closed cell foam for mounting that will hopefully lessen the shaken GPS syndrom. @ScottM, thanks! Your’s is the best recommendation in my book with your considerable experience in this arena. Exactly what I needed to here. Indeed the person that recommended this unit to me I’m guessing did so because you recommended it to them. 2) the ability to mark a huge array of resrouces from water to lodging to food to points of interest. If anyone has any other recommendations do tell. I’m just beginning to do what will no doubt be 10+ hours of research on this device before I get one. Coincidentally, I just replaced this with an identical unit after 4 years of service even after reviewing the latest models. It has been dropped not less than ten times (sometimes onto asphalt or rocks), bounced around (and kicked off once during a sketchy fall) on my handlebars, gotten wet, etc., and it finally died. I think the internal antenna broke after it dropped off the top of my truck onto the road (can’t see satellites but otherwise works fine). The battery life is as good as they mention… leave the compass and backlight off, and it’ll last for a long time (maybe as long as a couple of days straight if your batteries are strong?) It gets bonus points for using standard batteries (2 AAs). I’ve seen it get as low as 7′ accuracy, but usually runs at around 11′ (maybe 25′ if I’m in a canyon full of thick trees). When shopping for a replacement, all of the newer models came with bells and whistles that weren’t, in my opinion, worth the extra weight/reduced battery life. The accuracy is still on par with the best, and the price is even lower, since this isn’t the newest model. They also switched to a different mounting system for their newer models, so I would also have had to replace all of my existing mounting hardware. The storage card option is worth it – I used it to upload custom maps when touring Japan a few years ago, for containing high-def maps of the local area, and for storing track points (although it’s rare that this much room is needed – the onboard memory can cover a lot of distance with good trackpoint management). I always unload these to the computer at home, but if you keep these in your unit, there you go. Turn-by-turn navigation is also handy for driving in cities… apparently not all devices have this, which I figured was a standard feature. I’m not actually sure what I would do to this unit to make it better. Have the option of freeing some on-board space by deleting the Geocache functions and hunting/fishing almanac? I suppose a tri-axial compass would be nice for those rare times when I’m not moving but need to know which way is north (say it’s night out and I’m too stubborn to look at the map with the N arrow on it) and don’t want to hold the unit level. It even has a thermometer (throw the unit into diagnostic mode by powering it on with the joystick pushed in, and you’ll see the unit temperature in Celsius degrees – shouldn’t be too far off from ambient temperature). Regarding the mounting system coming slightly loose, I put a strip of electrical tape in the channel of the mount, which tightened it right up. Regarding power loss on rides, I had an old GPS-12 that did this, but I’m pretty sure it was because the four (!) AA batteries had a fair amount of play between them, such that a good bounce on the bike could momentarily break the circuit (which was fixed with a little piece of foam to take out that slack). I haven’t seen this at all on the Vista HCx. The new unit came with firmware version 3.30, which isn’t available through the web updater, and I can’t yet tell what enhancements/fixes come with this. I’ve used the standard eTrex CX for over 3 years now, it differs from the above model in that it has a slightly less sensitive receiver but otherwise its the same. CONCLUSION: Let’s put this at the beginning. If I were to get another GPS, it would definitely be a Garmin and would probably be another eTrex. Its just been fantastic. the ability to put Open Street Maps onto it makes it the perfect multi-disciplinary GPS for me. GOOD. Excellent battery life, easily readable in bright sunlight, takes separate AA batteries. Its very powerful, with an ability to customise the way data is presented. Its been very well thought through, I use it for a lot of marine work as well as cycling. BAD: Screen a bit small (fine for cycling but not so great for marine use), interface is slightly clunky now that everyone seems to use touch screens. Rubber ring around outside provides waterproofing, but many (myself included) found that the adhesive failed after a couple of years. I returned it to Garmin, who provided me with a replacement unit and another 12 months guarantee. Brilliant. Power loss on rides – I’ve not experienced this yet. Apparently it can also be fixed by putting a bit of foam into the battery area, just to snug up the batteries. I’ve been worried about vibration and have tried to work out how to mount it on me rather than the handlebars. SOFTWARE. For Mac users Garmin provide a very usable desktop application called Basecamp. The old PC software was fine too. MAPS: Garmin’s topo maps for the UK are totally pointless (don’t show tracks/paths etc) and a waste of money, I suspect they’re better for the US. But the big discovery for me is that you can put Open Street Map (OSM) maps on to Basecamp AND the handheld unit. For free. The maps are superb (South UK) showing tracks, paths, foliage, etc. You can check out the degree of coverage on OSM, most of Europe is pretty good, and what you see on the website is what you get on your little handheld. So don’t bother with paid maps, put OSM on, which is all totally legit. No hacking needed. OSM on Basecamp allows you to plan quite complex routes, and alternatives, and just upload them to the unit. Garmin also do routable road maps, which I’ve seen and which aren’t at all bad. POIs: Points of interest. You can create and add your own data files which appear on the maps. So I’ve added bike shops, camp areas and most importantly a list of all the best real ale pubs in the UK, courtesy of CAMRA. MEMORY: It uses miniSD cards. A read somewhere that they don’t recommend using anything over 2Gb, but this is enough to store maps for the whole of the UK. I seem to have verbal diarrhoea this evening.